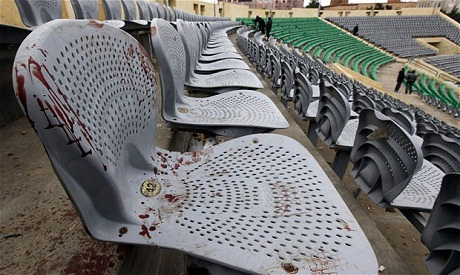 Death sentences handed to 11 defendants convicted of participating in the Port Said Stadium disaster of 2012 were referred to the Grand Mufti for approval on Sunday. Referral to the Grand Mufti is a necessary procedure before issuing a death sentence, according to Egyptian law, though the religious opinion of the Mufti is non-binding. The court has set 30 May for the date of the final verdict and placed a gag order on the case. Defendants hold the right to appeal against the verdict. Military and police forces were heavily deployed in Port Said shortly after the court decision, reported Al-Ahram's Arabic website. Seventy-three defendants stood retrial on charges of killing of over 70 Ahly fans after a match with Masry football club on 1 February 2012. Nine police officials were tried in the case but none of them were among the 11 who received the death sentence. In January 2013, a court sentenced 21 Masry fans to death while delaying the sentences on 52 others for legal reasons. Ahly fans welcomed the sentences but were angered that none of the nine police officers tried in the case were convicted. More than 40 people were killed in protests after the verdict in Port Said. In March 2013, an appeal court upheld the 21 death sentences, sentenced five people to life in jail and ordered jail sentences on the others, including 15 years for two police officers. Another 28 people were acquitted, including seven policemen. In February 2014, the court accepted a prosecution appeal in the case, ordering a retrial.